Universal App works on Apple iPad, iPad Pro and iPhone. Never struggle to mount picture frames onto your wall again! 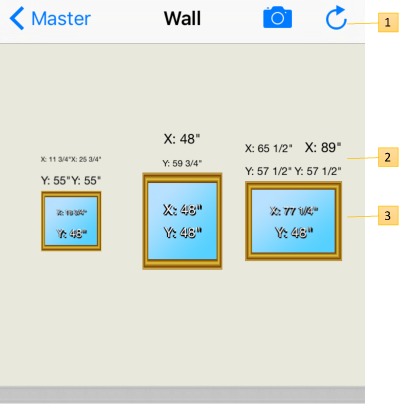 Use FrameN to calculate the proper mount positions on a wall for any picture frame. 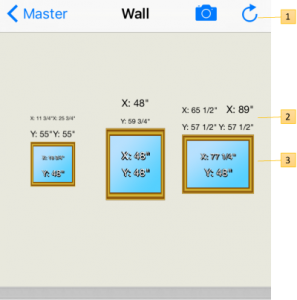 Now you can easily add pictures to your wall by specifying the picture frame width and height. 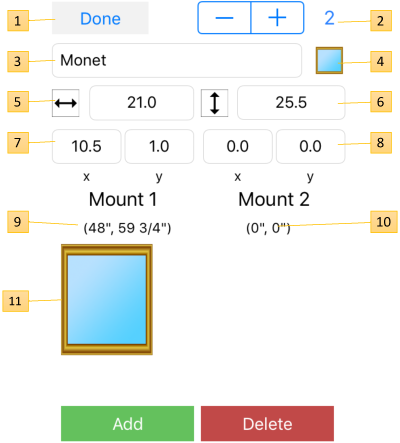 Next specify the frame mount positions on the back of the picture from left to right by entering the X (how far in from the left) and Y (how far down from the top) positions for each mount. Leave the second mount position blank for a single mount frame (like a center mount). FrameN also allows the use of photos from the Camera Roll so you can view the actual pictures on a wall before mounting them. 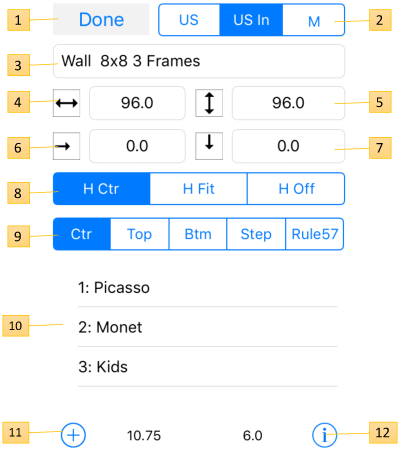 FrameN draws everything to scale whether you’re using an iPhone, iPad or iPad Pro which allows you to verify the separation of the pictures when mounted. 2. Mount Positions on the wall are shown on the main screen for convenience. 8. Horizontal Center; Horizontal Fit (even spacing); or Horizontal Offset (using the Horizontal Offset number) – See Horizontal Calculations Below. 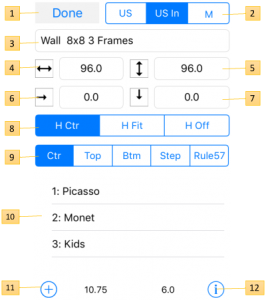 The Picture Frame configuration can be accessed by tapping on a picture on the wall. This action will bring up a configuration dialog for setting the picture frame properties as shown below. 2. Move through the other pictures on the wall using the +/- buttons. The picture number is displayed next to them. 4. Reset photo in frame to the generic blue with gold trim. Use this button to stop using a previously selected picture from your photo library. 7. Mount 1 X and Y coordinates. See Mount Coordinates below for more information on setting these. 8. Mount 2 X and Y coordinates. Leave 0 (zero) if this picture has a center mount. 9. The calculated wall mount coordinates for mount 1 are displayed here. 10. The calculated wall mount coordinates for mount 2 are displayed here. 11. Tap the picture frame here to import a photo of your picture from your camera roll. Use the Photos app to crop the photo down to just the picture frame. 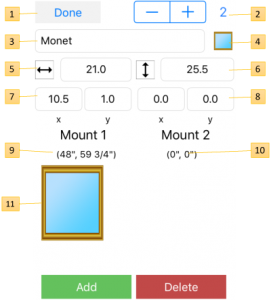 Add and Delete buttons allow for adding and removing picture frames on the wall. Delete will remove the current picture frame being viewed and Add will create a new picture frame. Horizontal Center: Center pictures evenly around the middle of the wall. Horizontal offsets may be different if all pictures are not the same size. Horizontal Fit: Evenly space all pictures on the wall which could result in off-center placement on the wall. Horizontal Offset: Use the user-defined horizontal offset to space the pictures away from each other. – Spacing is still based on the Horizontal rules listed above only it is applied to the stacked pictures.